Dengeki G's Magazine (電撃G's magazine?) 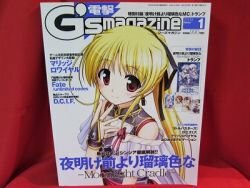 is a Japanese magazine published by ASCII Media Works (formerly MediaWorks) and sold monthly on the thirtieth that primarily contains information on bishojo games, but also includes an entire section on anime based on bishojo games, and serializes manga and light novels based on such games. If you love Japanese girl's game don't miss it!